When Samsung unveiled the Galaxy S4 during its press event, they brought along a bunch of accessories with it. One of the more interesting of the lot is a handheld controller that turns the phone into a full-fledged tactile gaming console. 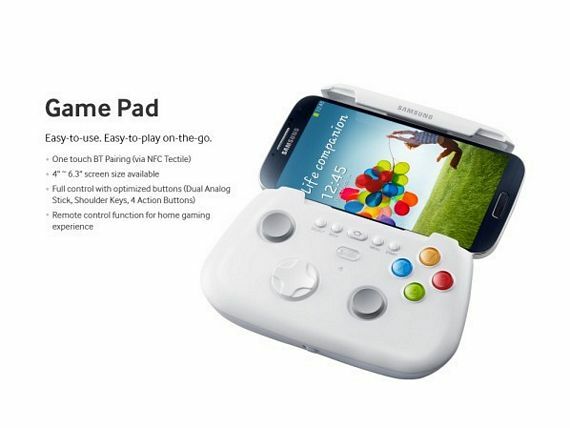 And that accessory, the Samsung Game Pad, is now up on the Galaxy S4 website. Sporting a layout and color scheme that looks based off the Xbox 360, it comes with a complete set of tactile controls -- two analog buttons, four action buttons, a D-pad, and a slew of function buttons in the middle. We're not actually sure where the shoulder buttons on the thing are (I'm guessing the rear), but it's supposed to have them, too. The Samsung Game Pad features a cradle on top that's sized to hold phones with displays measuring between 4 inches and 6.3 inches. Yep, 6.3 inches -- so wait for the endless rumors of Samsung's massively-sized mobile device. Like many smartphone gaming controllers we've seen, it pairs with your handset via Bluetooth, but adds Samsung's NFC Tectile system to allow for one-touch pairing. It also has a remote control function for use with TVs. While the Samsung Game Pad isn't the first gaming controller we've seen for smartphones, there's probably some upside in compatibility to opt for it if you use a Samsung handset. My only real concern, though, is the thing looks a little too big for comfort. Imagine walking around with a Galaxy Note II and this thing -- probably not so fun. There's no word, so far, on pricing or availability.